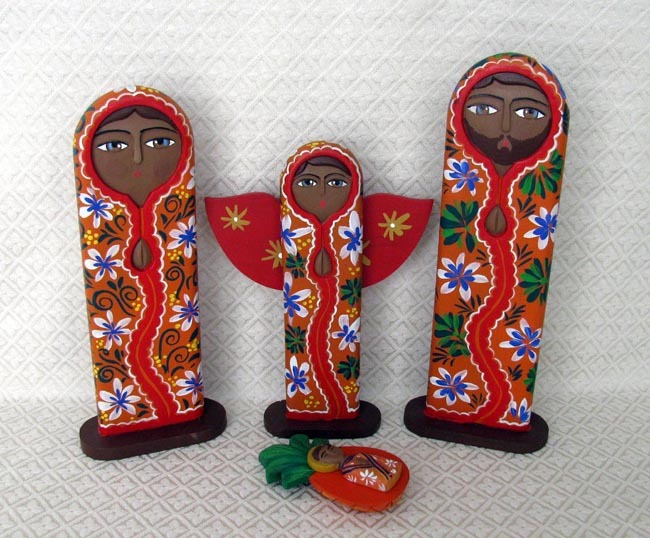 This Nativity scene includes the Holy Family painted in a wavy design of orange and red. The Holy Family is joined by one angel. Baby Jesus lies on a pineapple as his manger bed. Joseph stands 12.5 inches tall. The pieces are carved from cedar wood by the Jimenez Family: the mother, father, and many kids are involved in the process. The family lives in Masaya, a town close to Managua, the capital of Nicaragua. Then other artisans in Managua brightly paint the pieces on both the front and back. All of the figures are painted in unique floral designs, making each set one-of-a-kind.